- These colors can easily be overpainted despite the original emails without any complications while adhering to the proper drying time, e-mail and Aqua Color but can not be mixed together. 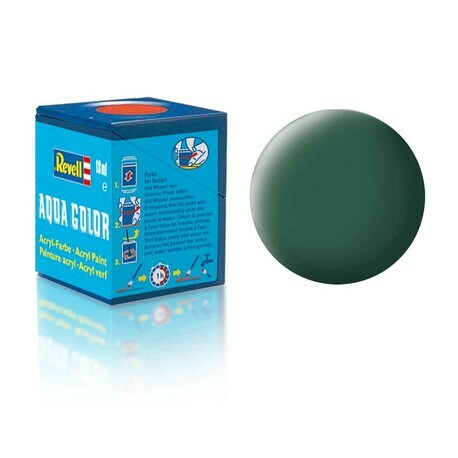 - It is best to thin the paint with the special Aqua Color Mix. It also serves as a retarder to prevent drying of the paintwork inside the spray gun. - The spray guns can be cleaned with water immediately after use. However, if the paint is already dry, you can clean the spray gun with "Airbrush Clean" or "Aqua Color Clean". - You can apply the paint with a brush, of course, and thanks to its even coverage it is no problem. - I can apply a brush to a surface almost as smooth as a spray gun. - The end result is totally comparable to the use of email colors. - I get brush with Aqua Color colors of excellent results. Rinse the brush and tools immediately after use with water. Close the container tightly after use. When opening, use as soon as possible, the air color dries out. Protect from frost. Contains preservatives Methylchloroisothiazolinone, Methylisothiazolinone, Benzisothiazolinone <" Note: Keep out of the reach of children. Dispose of this material and its packaging at the collection point for special or hazardous waste. Caution! Not suitable for children under 8 years of age. Children may only use the product under the supervision of an adult."